The Chevrolet Cruze does not have history on its side. The Chevrolet division of General Motors has historically done "big" well: big trucks, big family sedans and big V8 muscle cars. When it comes to small cars, though, the General hasn't been so good, with the lamentable Cavalier and Cobalt being the two most recent examples. 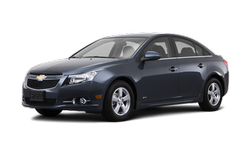 But that's changed with the compact Chevrolet Cruze sedan, an honest first-class upgrade that leaves pedestrian design and suspect quality behind in favor of well-rounded sophistication that meets its world-class competition head-on. The Cruze's handling is sharp and precise, but the most welcome improvements involve a roomy cabin and vastly improved styling and quality. With a variety of truly impressive competitors available these days, we wouldn't exactly call it a class leader, but the wholly competent Cruze shows that Chevrolet can now do "small" as well as "big."